Connect the Dots - Conversation on Sustainability, Social Good and Us! Public Dicussion on Commuter Rail Service at Tumkur, Ramangarm, ITPL etc. "..Madam Speaker, as you are aware, Bengaluru with bustling, business activity attracts large commuters from surrounding rural areas and towns necessitating better connectivity of Bengaluru City with its suburban areas and hinterland. Study to Explore Possibility of enhancing the existing IR network of Bengaluru for meeting the above need will be taken up. In addition, to cater to the demand of Passenger Traffic in Bengaluru area, Byyappanahalli will be developed as a coaching terminal..."
In addition, he has announced these train services to give immediate relief to the commuters. The ball is in GOK court now. GOK must start the conversation with Railways to operationalize the SPV and get down to implement the Phase-1A. The approval process does take time in normal course of action. However, if GOK specially our Chief Minister can take up this personally with the Union Railway Minister, there is a real chance for early approval to the project. We all can help in that process if each one of us can reach out to our local area MP/MLA and pressurize them take up the issue with both the CM and teh Railway Minister. Do not have the contact information? Don't worry. Here is the link for post with contact information for all the MPs/MLAs whose constituency fall in the proposed suburban rail network. Have questions? Email it to "nammarailu@praja.in"
The population of the Bengaluru Urban area grew by 35% in the 1991-2001 decade and by about 47% in the 2001-11 time period. In order to cope with this growth the government has invested heavily. BMTC has added 3500 buses from 2006-07 to early 2011. Huge amounts of money have been invested in upgrading roads, building grade separators, the B-TRAC project and most recently for the Metro rail project which will add 115 kms of mass transit (phase-I and phase II combined) for a total estimated cost of 38,000 crores. However, most experts are in agreement that even with the Metro fully operational, Bengaluru's public transport requirements are going to continue to exceed the combined capacity of BMTC and Namma Metro. Here is where commuter rail comes in. Couple of praja members had requsted for CRS publicity posters. Here are 2 versions of CRS posters in Kannada. You all may feel free to use it for CRS publicity at workplace, apartment societies, Malls and public spaces. Please feel free to print, distribute and display at prominent locations. Department of Urban Land Transportation (DULT) in GOK had called a meeting with all the stake holders of 'Commuter Rail' to discuss the 2012 RITES report on Implementing Commuter Rail Service in Bangalore. 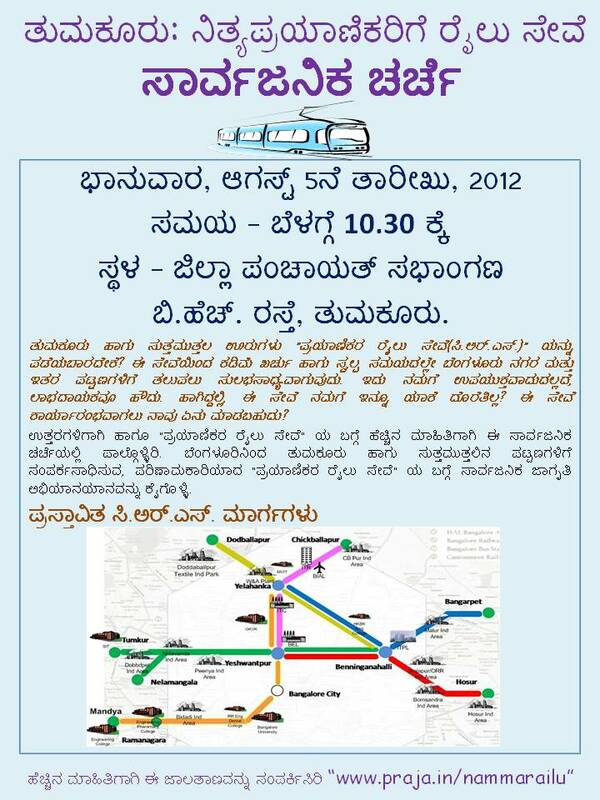 Time to indulge in some talk on Namma Railu aka Commuter Rail Service (CRS). RITES has submitted a report to DULT last week. Sources claim that Rs 3000-4000 Crore can give Bangalore a 15 minute lead time commuter rail system covering 200 odd kms of distance. We will validate this once the RITES report is made public. Here is the RTI reply from SWR for the track improvements at Bayippanahalli. Till now how SWR has fooled public on its tracks being over utilized. Its high time SWR / GoK start thinking that they exist for Citizens and they should serve in the interest of Citizens. What matters for Commuter Rail Sucess? "..most important things in success of commuter rail is, geographic location, geographic location and geographic location."